Guai Shu Shu is a "shu shu" that is "guai"…. WHO IS GUAI SHU SHU? 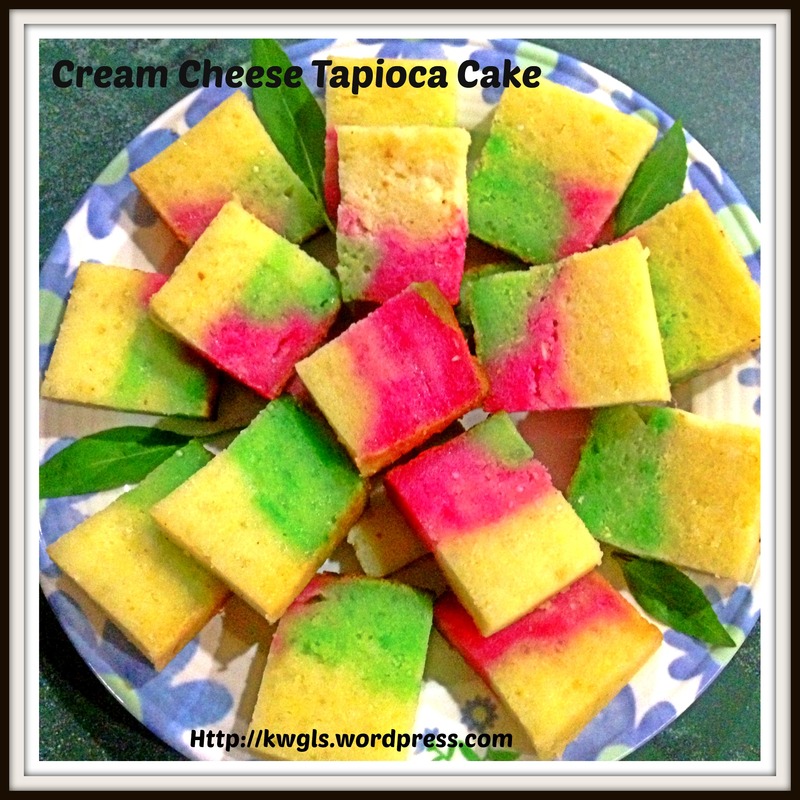 Tapioca or cassava is a staple root widely consumed in regions like Africa, Asia, Oceania and etc. It is easily propagated and commonly found in South East Asian countries. 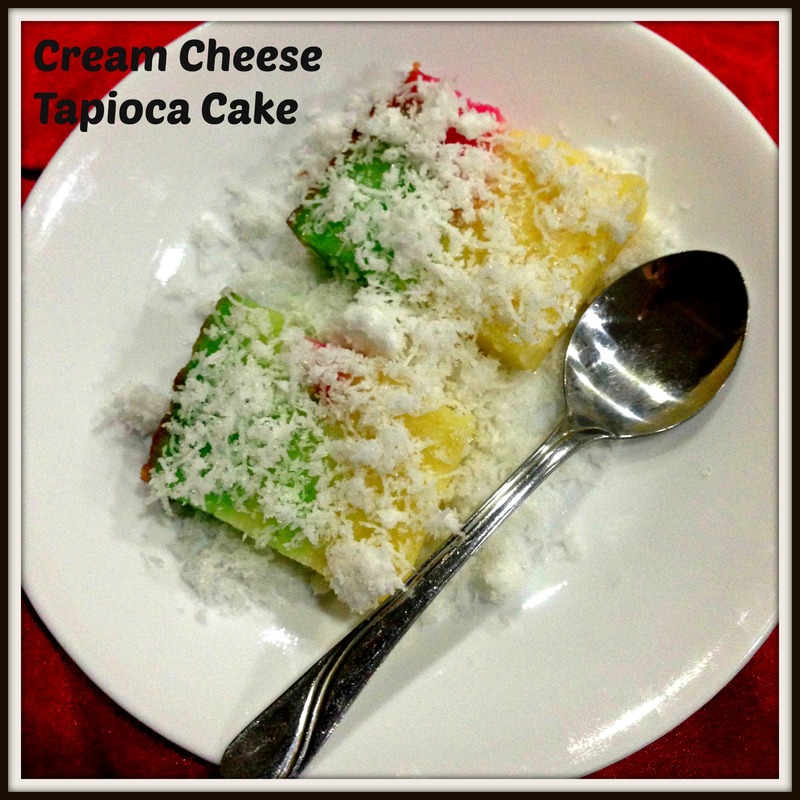 Thailand, Vietnam and Indonesia are the top three exporter of tapioca in the world. 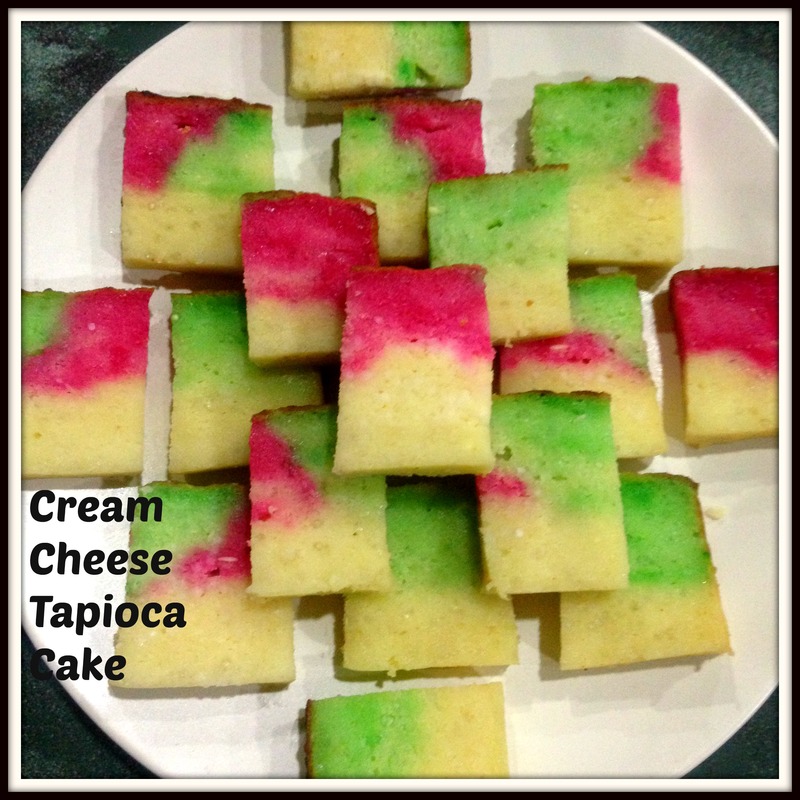 Tapioca or cassava cake is a very common household cake of any races (be in Chinese, Malay, Indian or other races) in Singapore and Malaysia. 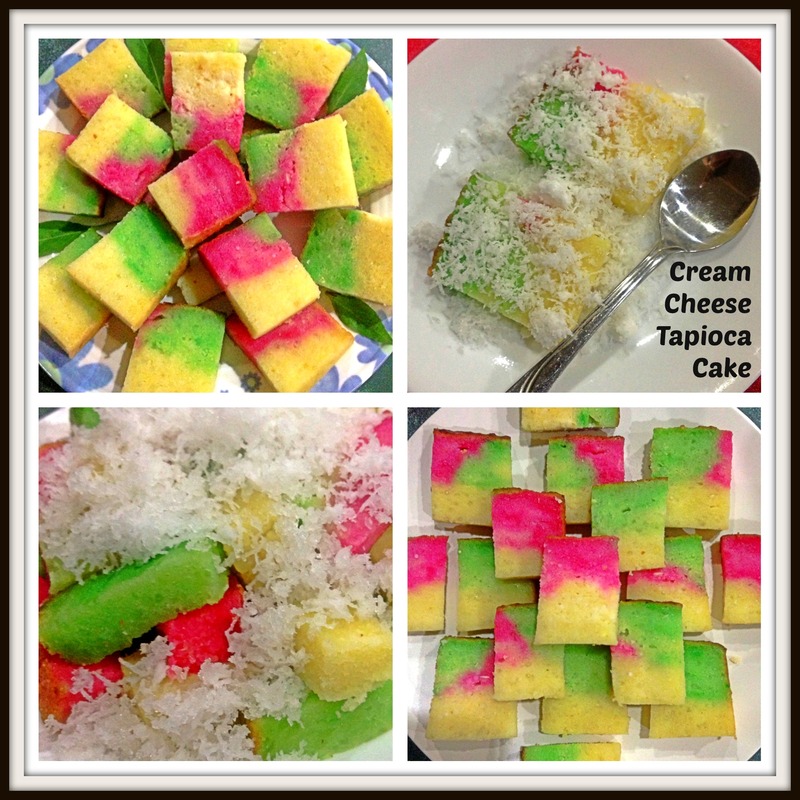 However, in the Peranakan cooking, Kueh Bengka Ubi is one the most famous items in its cuisines. 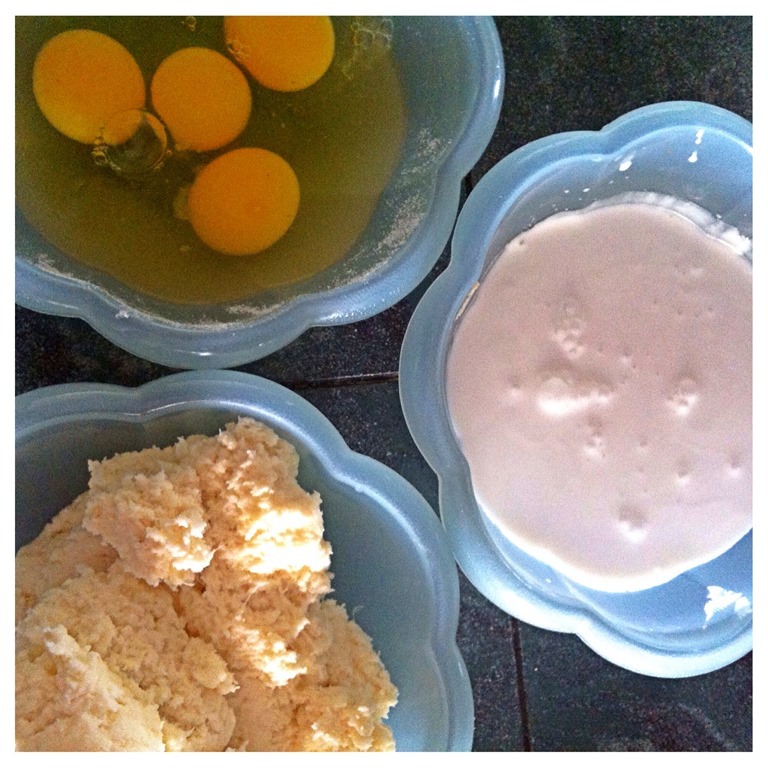 There are generally two methods of making cassava cake, by steaming or baking. Chinese preferred to have its cassava cake steamed, as soft as possible and served with shredded coconut (at times this is needed as the cake are so soft and smooth that it is shapeless). On the other hand, the Nonya preferred to bake the cake using charcoal stoves or ovens. Usually, the baked cassava cake have a slightly burnt crusty top and the body is yellowish in colour and texture is rather “elastic”. It is very aromatic with a mixture of fragrances from pandanus leaves, coconut milks and eggs. This recipe is my own without making reference to any recipes in the internet. As usual, I have prepared based on what I think is workable, memories on the cake that I have tasted before and one or two attempts a few months back. This cake is different in its texture and its taste. 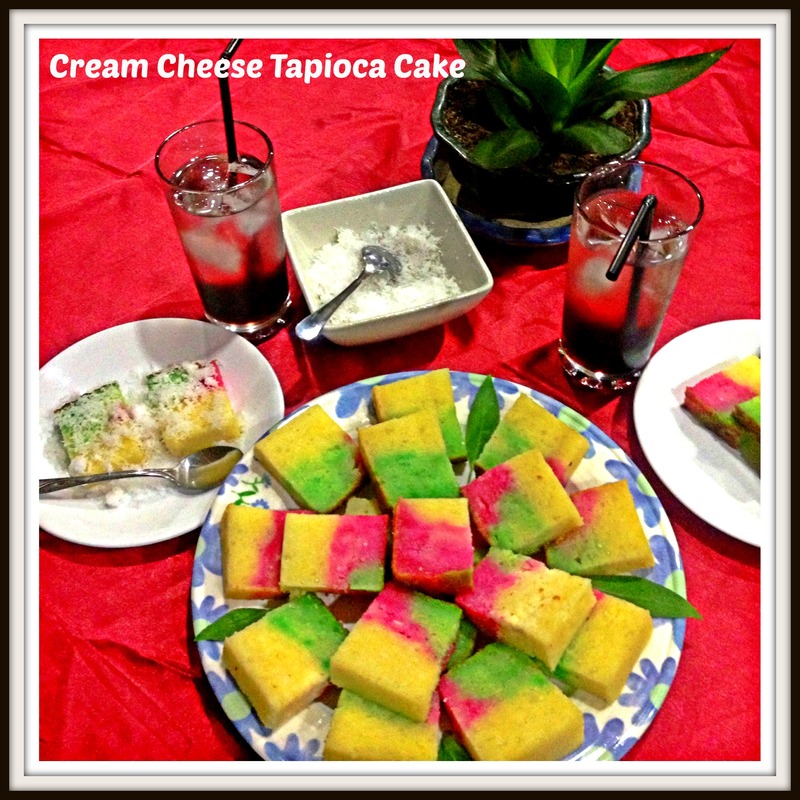 Besides the normal fragrance of the traditional cassava cake, the cake have a rich and cheesy fragrance. In addition, as you can infer from the pictures above, the texture is moist but not soggy or sticky. In fact, you can cut it into any shape that you want. 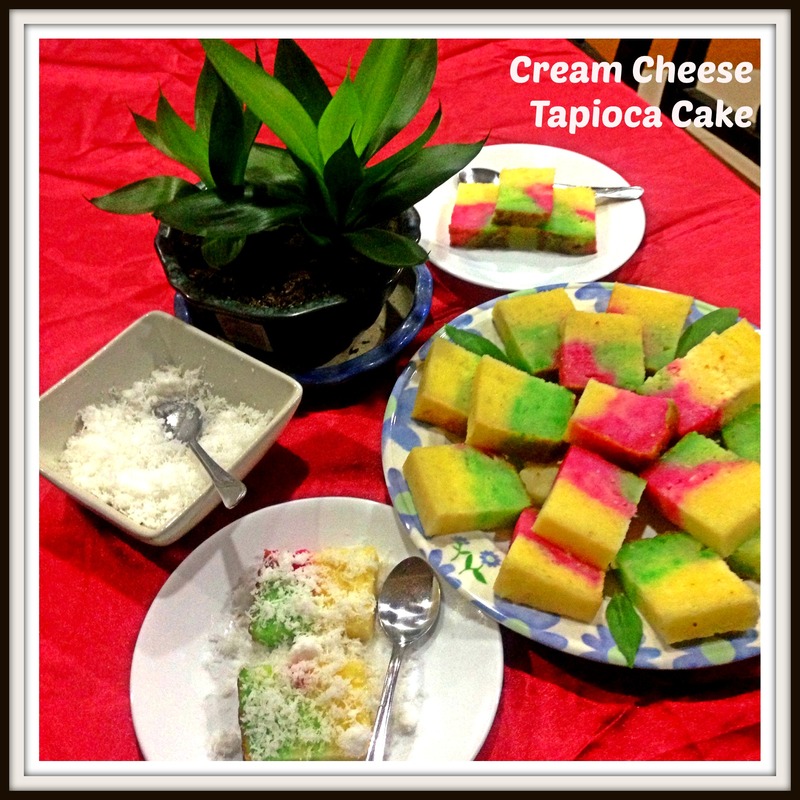 The incorporation of cream cheese had made the cassava cake smoother and creamier. It helps to heighten the flavour of the eggs, coconut milk, butter and the cassava original flavour. I have used small sago balls to enhance the texture. Grated cassava, under high heat can turn very sticky and subsequently become very chewy. The additions of sago balls somehow will help to sooth the texture making it even smoother. 1 kg of finely grated tapioca or cassava. You can buy in the market and grate it yourself. If you want to grate it yourself, you will have to use the food processor to chop it as finely as possible, and then you can proceed to use a blender (instead of an cake mixer) to perform the following steps. You will need to put in your chopped cassavas, eggs, coconut milks and blend it to as smooth as possible). 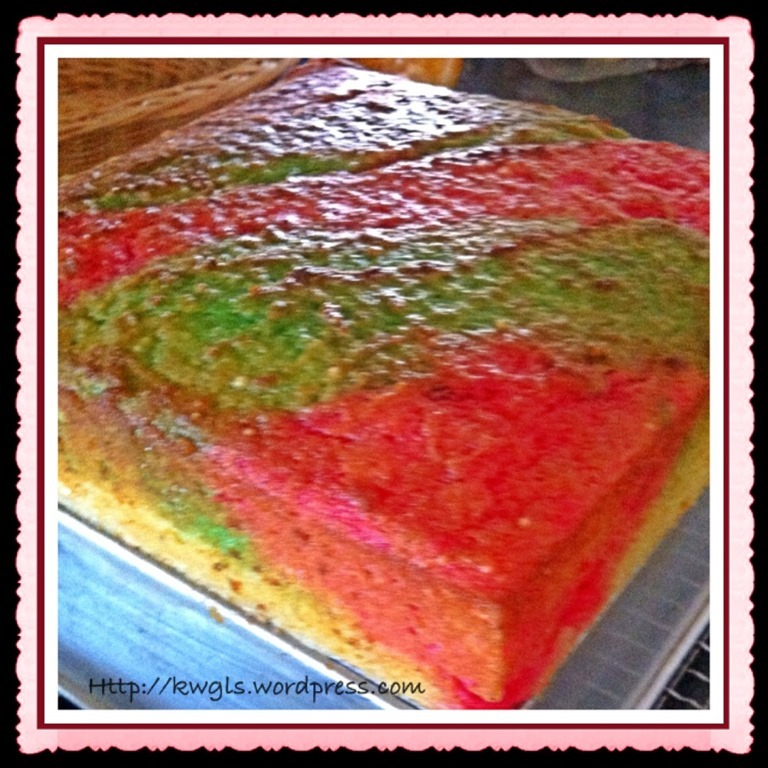 Red and green (pandanus) colouring (optional) – I have resorted to the use of red and green colouring this illustration as I find that the traditional cake are rather dull in colour and I want my cake to look more colourful and appetizing. Pre-heat your oven to 180 degree Celsius. Get ready a 8 inch x 8 inch baking tin. Slightly grease the tin with either butter or cooking oil. Dust some wheat flour if necessary. 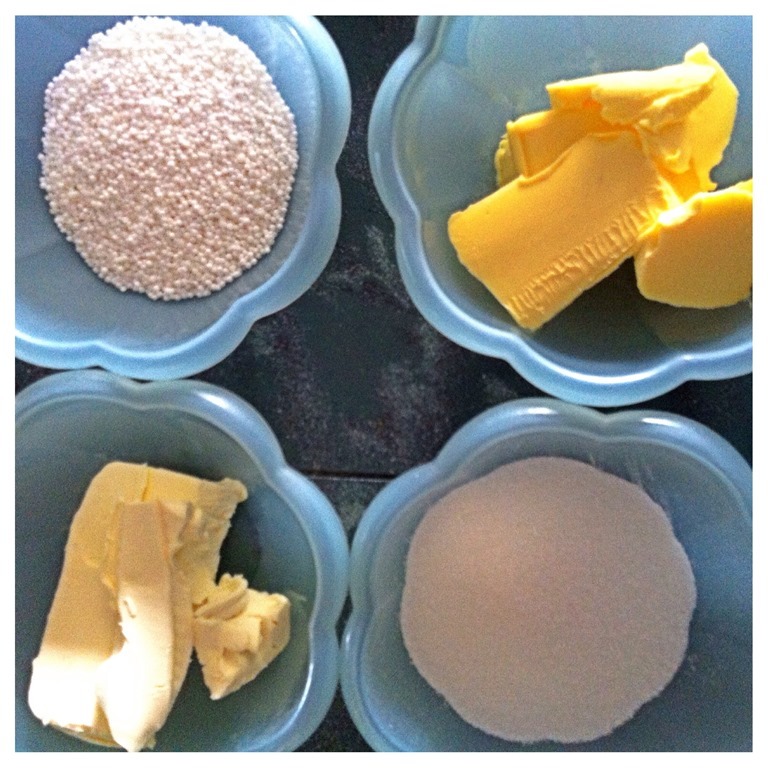 In the mixing bowl, beat your butter, cream cheese and sugar using medium speed until evenly mixed. Note that the purpose of this step is not to let you have a fluffy cake like other cake recipes. 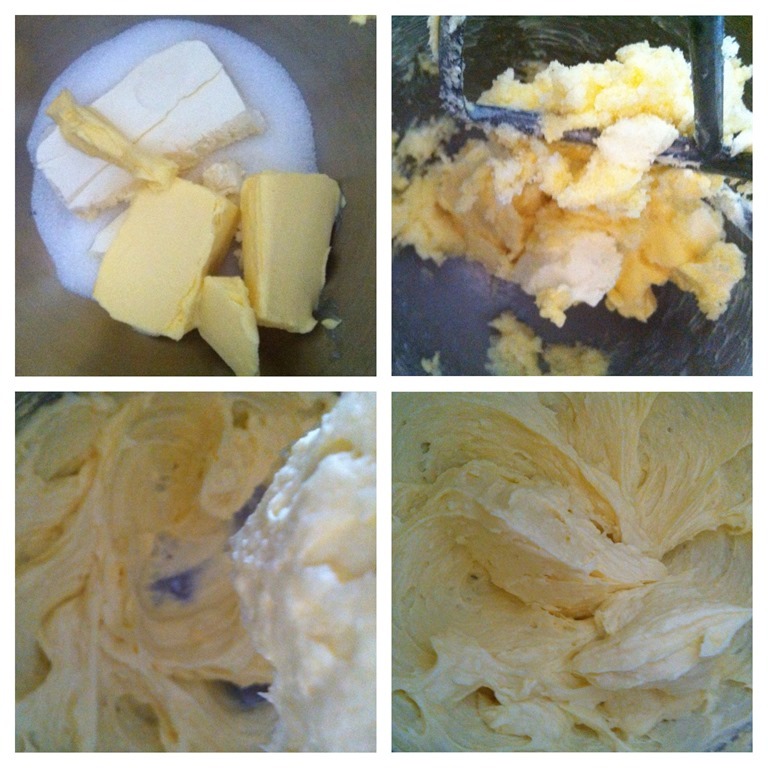 The beating here is mainly a mixing step, a step to ensure that the butter and cream cheese are evenly mixed. Once well mixed, add in your eggs one at a time and followed by the coconut milk. You should only use low speed for this simple mixing purpose. 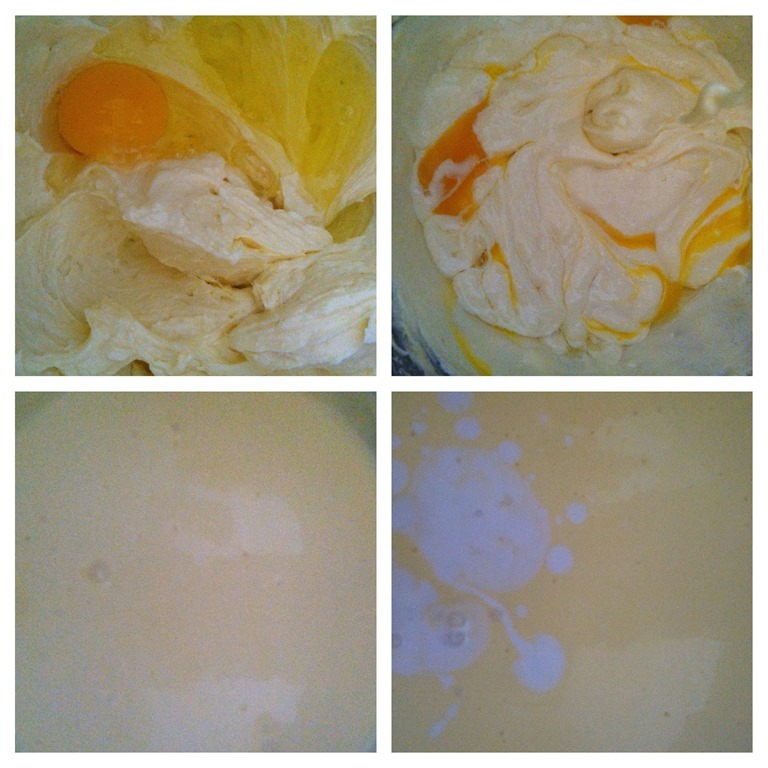 Scrap out the bottom and sides of the mixing bowl to ensure that there are not cheeses sticking to the bowl. At this stage, you will notice that the mixture become more and more watery which is normal and hence SPEED SHOULD BE LOW as long as mixing can be performed. Add in the grated cassava and soaked sago balls. “Beat” at the lowest speed possible. You will see that after 1-2 minutes of slow mixing, the liquid start to disappear as it was further absorbed by the sago balls. Separate into approximately 4 equal portions. 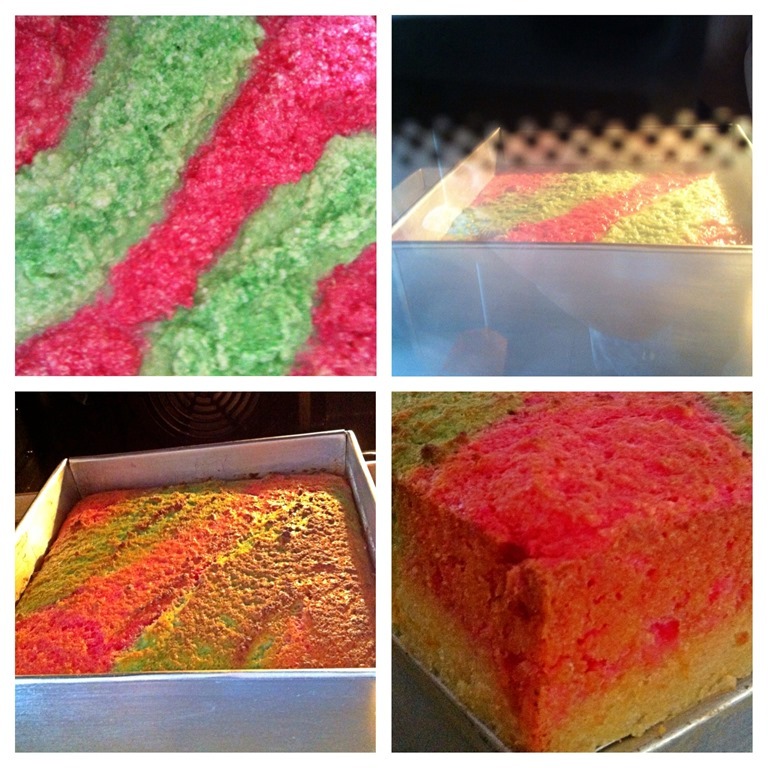 One portion with red colouring, one portion with green colouring and the other two portions maintain the original colour. 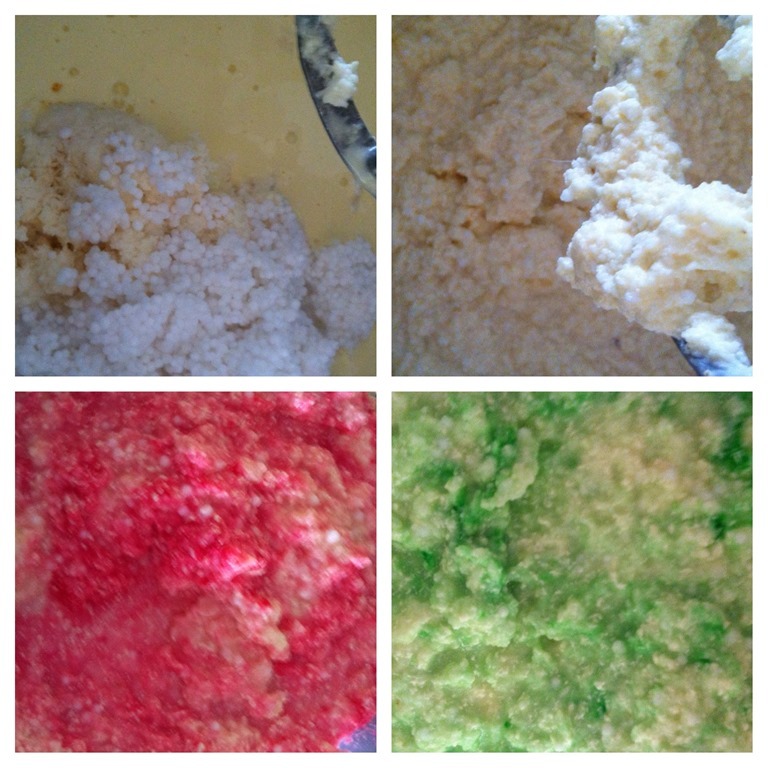 Pour the uncoloured portion of the batter to the tin, followed by green and red portion. It is entirely up to readers as to what design you want your cake to cook like. For me , I have opted to have some simple big stripes design. As the batter is not very watery, it is rather easy for you to design your pattern. Baked using 190 degree Celsius for about 30-45 minutes or until set. Until set means when you push the baking tin, the centre of the cake does not “vibrate”. Another test is that you insert a skewer in the centre of the cake, the skewer come out clean. However, as this is a cassava cake, cassava when hot can be slightly slimy and as long as you taste it is not raw, the cake is consider as cooked. Leave the cake in the tin for about 10 minutes before turning out onto a wire rack to cool completely. Cutting of cake is best done 3-4 hours after baking to ensure that centre of the cake is completely cool. As long as when you cut the cake, there are some cake stick to the knife, your cake is considered as not cool completely. Serving suggestions – you can serve with shredded coconut with white sugar and hot tea or coffee. 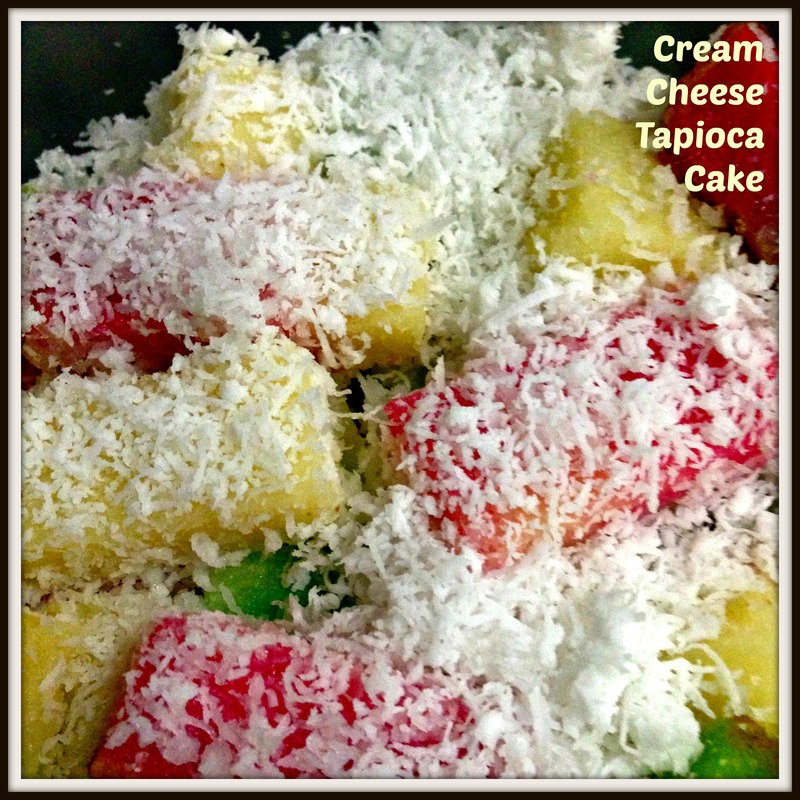 This is a modified recipe by incorporating cream cheese and sago balls to the traditional cassava cake. 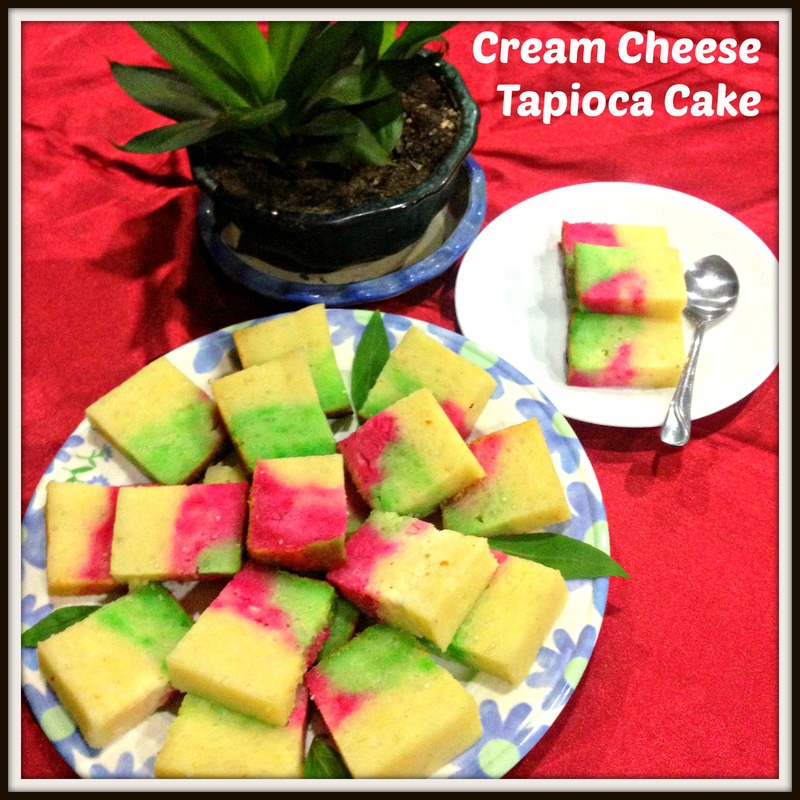 The main aim is to smoothen the cake texture and make the cake creamier along with the fragrance of eggs, coconut milk and cassava. Resulting from the modification, this will be totally different from the traditional cassava cake that you may have tried. It is soft, slightly springy and with cheesy coconut fragrance. 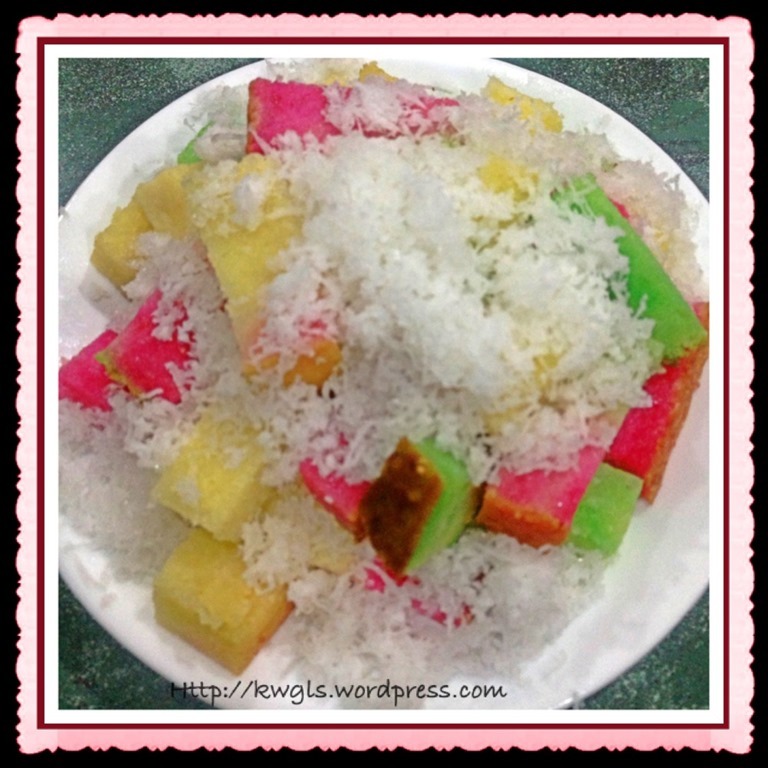 The shredded sugar coconut with heighten the palate and reach another higher dimensions. It is easy to cut into your desired sizes and looks presentable in tea party as a snack items. If you think that you are a professional Nonya cake baker, you should try and tell me what is your opinion. If you are new to pastry making, this is one item that will not ruin your confidence. For more recipes, you can refer to my RECIPE INDEX here and you can follow me at PINTEREST or visit this blog’s FACEBOOK PAGE . This entry was posted in Cakes and cookies, Chinese and Asian Cakes and Snacks, Food Preparation Series and tagged 8, addition, additions, Africa, Another, asia, Asian, ball, Balls, Beat, Bengka, Besides, blender, butter, Cake, Cassava, Celsius, Cheers, Cheese, CHEESEY, Cheesy, CHINESE, coconut, CONCLUSIONS, confidence, cream cheese tapioca cake, cuisines, degree, dimensions, Dust, East, fact, food, fragrance, fragrances, Hope, hours, illustration, incorporation, Indian, indonesia, INTRODUCTION, item, items, kueh, kueh bengka ubi cream cheese, kuih, Leave, Malay, malaysia, memories, mixer, mixture, modification, nonya, Note, Oceania, Once, opinion, oven, ovens, palate, Pandanus, pastry, peranakan, postaday, Pour, preparation, processor, purpose, readers, recipe, Recipes, reference, Regions, sago, Scrap, Separate, SHOULD, singapore chinese, sizes, snack, South, STEPS, stripes, suggestions, Tapioca, tapioca cake, texture, thailand, Traditional, version, Vietnam, Volume. Bookmark the permalink. ← Is It Snow Flake? No, It Does Not Look Like, Then, What is This?